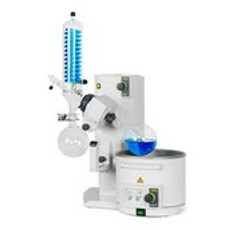 Laboratory rotary evaporator for evaporation flasks of up to 4 L. Motorized quick-action jack easily operated with one button. Cordless heating bath for water and oil, with digital display, for a heating range of 20-180ºC. Long-life seals enable practically maintenance-free operation. Continuous vapor duct easy to remove and clean, preventing cross-contamination. Buy and sell, new and used Buchi R-215 rotary evaporators on LabX. Find the ad you like and contact sellers below to purchase.